Epic I at 10807 New Allegiance Drive is Colorado Springs’ newest multi-tenant Class A office building. Crescent adds 13 Colorado Springs buildings to its portfolio of office assets in Colorado. DENVER, CO, US, December 6, 2018 /EINPresswire.com/ — Crescent Real Estate LLC (Crescent) announces the acquisition of the Patriot Portfolio, a 1.02 million-square-foot portfolio of office assets in Colorado Springs. The Patriot Portfolio consists of 13 separate Class A office buildings in two Colorado Springs submarkets. Five buildings are in the North Interstate 25 submarket and eight buildings are in the Airport submarket. The Patriot Portfolio represents 13% of the approximately 8 million square-foot class A office market in Colorado Springs. According to Steve Eaton, Senior Vice President of Crescent, a key factor in making the investment is that the Colorado Springs economy has diversified during the past decade with information technology, healthcare, engineering, and consumer services joining the military defense contractor presence in the Colorado Springs office market. Population growth in Colorado Springs from 2010 to 2017 was 10.6%, doubling the national average of 5.0%. Ten of the 13 buildings in the Patriot Portfolio were built after 2001, with eight of the buildings developed between 2006-2009. The five North Interstate 25 submarket buildings are located in the Interquest Business Park, and feature attractive architecture and quality construction, as well as offer mountain views of Pikes Peak and the Front Range. The eight Airport submarket buildings include five in Patriot Park, adjacent to Peterson Air Force Base, two in Aerotech Commerce Park, just south of Patriot Park, and one building in Peak Innovation Park adjacent to the Colorado Springs Municipal Airport. "These assets are generally regarded as the nicest, newest and highest quality buildings within the Colorado Springs metro area,” said Michael Bannon, Vice President of Crescent. “Crescent is thrilled to establish a large footprint in The Springs and build off the momentum that both the North I-25 and Airport markets have been experiencing." Epic I at 10807 New Allegiance Drive is Colorado Springs’ newest multi-tenant Class A office building, which was constructed in 2009. Visible from Interstate 25, Epic I offers efficient 30,000 square-foot floor plates, features mountain views of Pikes Peak and the Front Range and has a LEED Silver certification. Interquest I, II, III and IV located on Federal Drive are single-story Class A office/flex buildings in the Interquest Business Center with immediate access at Interstate 25 and Interquest Parkway. Each building is visible from Interstate 25 and features mountain views of the Front Range. Interquest I was built in 2009 and Interquest II in 2008. Each has a LEED Silver certification. Interquest III and IV were built in 2001. Five buildings are located in Patriot Park near the intersection of Powers Boulevard and Galley Road, adjacent to Peterson Air Force Base and in close proximity to Academy Drive. Each property features efficient and flexible floor plates. Patriot Park I at 985 Space Center Drive is a three-story building constructed in 1989. Patriot Park II at 980 Technology Court is a single-story, single-customer office/flex building built in 1984. Patriot Park V at 745 Space Center Drive is a two-story office building constructed in 2006. Patriot Park VI at 655 Space Center Drive is a three-story Class A office building constructed in 2008. This property has a LEED Gold certification. 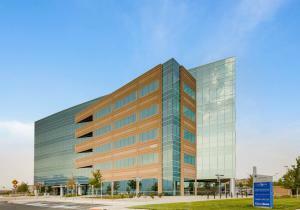 Patriot Park VII located at 565 Space Center Drive is a three-story Class A multi-tenant office building constructed in 2009. The building is LEED Gold certified and features outstanding mountain views. Two buildings are located in Aerotech Commerce Park just south of Patriot Park on Powers Boulevard. 1055 North Newport Road is a two-story Class A multi-tenant office building constructed in 2008 and features outstanding mountain views, with an efficient, flexible floor plate. Newport Centre One at 1670 North Newport Road is a four- story office building constructed in 1987 and renovated in 2016. Northrop Grumman Point at 3535 Northrop Grumman Point is a three-story Class A office building constructed in 2008. It is located in the Peak Innovation Park adjacent to the Colorado Springs Municipal Airport. Crescent previously owned the Briargate Office Center, a Class A 155,000 square-foot office building in the North Interstate 25 submarket. Crescent also owns other Colorado properties, such as the legendary Brown Palace hotel complex, the Platte Fifteen development, Tuscany Plaza in Denver and Flatiron Park in Boulder. Jim Curtin of HFF represented Crescent in sourcing debt on the deal, and Aaron Johnson and Jon Hendrickson of Cushman & Wakefield represented the seller. Crescent Real Estate LLC (Crescent) is a real estate operating company and investment advisor, founded by Chairman John C. Goff, with assets under management and investment capacity of more than $4 billion. Through the GP Invitation Fund I, the company acquires, develops and operates all real estate asset classes alongside institutional investors and high net worth clients. Crescent’s premier real estate portfolio consists of Class A and creative office, multifamily and hospitality assets located throughout the U.S., including The Ritz-Carlton, Dallas, and the wellness lifestyle leader, Canyon Ranch®. For more information, visit www.crescent.com.